Make your message stand out with this pack of American Metalcraft BLSMA100V4WH Securit all-purpose white mini tip chalk markers! These markers are great for drawing attention to your menus, signs, and other attractive marking displays. This four-pack offers a convenient way to write on a variety of non-porous surfaces, from chalkboards to glass, mirrors, plastic, metal, and more! These Chalk like Markers are a great pack to buy. I have used these markers to right mini menu boars for food items for parties and works great. The chalk markers are great for a special menu board. Used them for our menu on the food truck. Easy to erase and make changes. They have a chalk look to them for sure. Thank you for your review, Sal! We are sorry this American Metalcraft BLSMA100V4WH Securit All-Purpose Mini Tip White Chalk Marker - 4/Pack has not worked well for you. A Customer Solutions Representative will contact you soon! These markers are junk, they don't last long at all. I would not recommend them. We have only used them a few times and they have already ran out. These chalk-like markers fit the need of our menu board. They last a long time, in fact if you don't wipe it down clean within a few hours you'll see it on your chalkboard forever. It takes just a little bit of a warm wet cloth to get it wiped off and the board needs to be completely dry for you to rewrite on it. The downside is that each marker doesn't last very long. We write our menu every day and in 2 weeks have gone through 3 of them. Thank you for your feedback! If you have any concerns with your product at any time please reach out to our Customer Solutions team! When you have chalkboards, you need chalkboard markers, which is why we chose these Securit All-Purpose Mini Tip White Chalk Markers. They arrived exactly as pictured and perform to our expectations. These work very well,they write nice and smooth. You just need to shake them up good to get if flowing.the white definitely stands out on black board,no powdery mess! These chalk markers were perfect for writing on chalkboards and on glass. We wrote our seating chart on a glass door. Dried quickly then washed off with a paper towel and water. So useful, plan to keep some on hand! These markers create a beautiful chalk line without the inconsistencies of more traditional chalk, and also hold up to being bumped. As the ink comes off with water, it allows for a quick change without any residual writing from previous messages. These markers are nice to write if the ink comes out. However, the ink gets dry quickly. The ink in two out of four pens that we got was dry and cannot be used. Will not buy again. These pens were a little thinner than I anticipated. They make small writing easier but for an A frame chalkboard or a large scale board you might want the bigger pens! These write clearly and the color is bright white and vivid initially. My only complaint is after a couple uses, they tend to run slightly and dry up quickly it seems. But they are way more resistant and brighter than regular chalk. I plan to keep buying them for my chalkboards and Mini Chalk Cards used in a bakery display. I love chalk markers. This is a great price. I have a hard time finding these in the store. I enjoy that they wipe pretty clean, as long an they have not been on a sign for a super long time. These chalk markers are the best invention since chalk. They give you the look of a chalkboard without all the dust and mess. A perfect purchase! These markers are not quite as good as the wide tipped Chalk ink pens but they do work for smaller more detailed menu spaces. we buy these for daily boards . These chalk markers work great on all types of chalkboards, make sure you follow the directions on the back of the marker and they are easy to use. Very nice mini tip white marker, shows up nicely on our large black chalkboard. Erases easily with soap and water. Would highly recommend for advertising purposes in any location. I write chalk menus constantly and these are great if you need a little smaller lettering than a chisel tip provides. It doesn't have a sharp tip but is enough for clear, smooth letters and images. If you're using trendy blackboard labels or larger blackboard signs, you need these markers! No one wants to write with traditional chalk, but these provide the same classic appearance with a tidier appearance and no chalk dust. The pack of 4 American Metalcraft All-Purpose mini tip White Chalk Markers are good alternatives to normal chalk. They provide a full, clean line that is good for creating menu boards and item signs. These markers wrote clean sharp lines on our food labels for our event. The white was nice and bright and these markers had a nice flow to them... unlike some others we have used. Webstaurant never disappoints. Best chalk markers we have ever used. We purchased these complete with the signs and they have been fantastic so far. We liked them so much we ordered another set. We purchased the pens for wedding guests to personalize the wedding favors which are mason jar mugs we also purchased from Webrestaurant. The pens arrived in perfect condition, and work great. GOOD BUT DONT LAST LONG NEEDED TO ORDER MORE AS THE FIRST PACKAGES LAST ONLY FEW WEEKS DUE TO TOP PIN GETTING LOOSE BEFORE CHARCOAL IS OUT . Love these white chalk markers! Designed like a marker which gives you a more finer point marking to reduce correction. This marker also wipes off easily! Great Product! This is a good price for these chalk markers. I deducted one star because the ink takes a while to dry so it will smudge if you aren't patient. But generally, these are very good chalk markers. These white mini tip securit markers are wonderful to use on labeling or windows or chalk boards!!! They don't even take a really long time to start--just shake them and then start them once you see the ink flow into the tip. They write so smoothly too!!! Love this item! I use it on my chalk board menu! It looks really good doesn't run and lasts a long time! This is a great product for the price! Windows or chalk board. I bought these to write on the ornate labels that are also sold here to put on the metal canisters. They write well on the labels. These are decent chalk markers, they show up great on black chalk boards and labels. Since they are markers there is less mess and they are easier to write with than traditional chalk. nice bright white pens - tips are a little smaller than we had hoped for - seems to write nice and has a quick dry and bright white color. These pens work well. But just a heads up. Shake the pen very well. Upside down. If it does not write right away. Then just run it under the water really quick. Whalla....you have a bright white liquid chalk pen on your chalkboard of choice. You can not beat the price. We really love these chalk markers. I'm really impressed at how long they last. Really love the look of these markers on our chalk boards. Very nice markers. I have used them on chalkboards and on glass. They worked very well on both. They are priced nicely. Will purchase more. Not very good pencils. One was already dry in the package. Doesn't write well, ink doesn't come out very thick. Probably will not purchase this itiem again. Thank you for the review! We're sorry you've been having issues with these. To help these work properly, we recommend firmly pressing the tip against a hard surface until the ink begins to flow. These are perfect to write on our specials board. Far easier and cleaner to use than chalk, and just as easy to clean off. They require a bit of shaking to get going, and you have to remember to point the nib slightly down to get a consistent line. These markers are great ! Bright white and solid output on a black surface. I will definitely need to purchase the wider tip next time for my A-Frame sidewalk board. The tip is too small to write bold messages to be read from a distance. These are better for tabletop labeling and finer details. Will definitely re-purchase !! These chalk pens are great very fine tip chalk markers. Finest tip I have found writes well too. Very good product. Will order again and again. These markers were a mid for us, some worked but most didn't. I'm not.surr if they were old for dried up. Customer service was great to refund and we went withi old school chalk. Chalk it up for service! 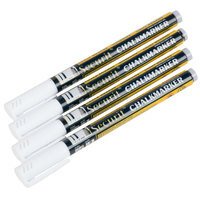 American Metalcraft BLSMA100V4WH Securit All-Purpose Mini Tip White Marker - 4- Pack markers work great. They come in white or you can find them in tropical or different assorted colors. These mini tip chalkboard markers are perfect with chalkboard paint, chalkboard stickers, and mini chalk cards. We use these for labeling everything, from coffee flavors to events on our wall calendar! I love these markers! We use them to write on very small bakery display cards. The fine tip helps write in small text. The marker lasts quite a long timE and the tip doesn't flatten or lose it's shape like some other markers can. I definitely recommend them! These chalkboard markers are great for my daughters wedding to write on the chalkboard labels on our guests mason jugs. There are a great value for the quantity. These are nice, thin chalk markers perfect for writing on product tags. We use chalkboard plastic signs on stands for our products, and these markers have been the best to write them with. They last awhile, and write clearly.